This is the next entry in Best Album Covers, a series begun right here. The first successful long-playing microgroove record for the phonograph was introduced by Columbia Records back in June of 1948. Yet, album covers (the paper board packaging that held them) didn’t come into their own graphically till decades later. Eventually becoming the cultural stamp on the music of the time. Catching the eyes of potential record-buyers and later their ears and minds. Melding the musical experience with the artist into a unique visual form. Why Compact Disc versions of album art don’t exactly raise the same reaction these days was looked at in this post. Although, music label artistry continues to be noticed and discussed among the material published today. The bits and bytes are looking over their shoulder, though, because vinyl hasn’t entirely gone the way of the dinosaur. Online or at the record shops still out there. Cover art hasn’t lost purpose, either for old and new. Mostly, it’s my contention while digital reigns supreme, its vigor among fans lacks the tactile passion of the past LPs. Hence the reason for this series. Some register more with me musically than others, though. Yet, the artwork will always take center stage, at least here. Let’s continue, shall we? I’ve mixed feelings toward “live” albums, sorry to say. When they’re good, they are special, offering a vitality and a spontaneity with material. More than happy to buy and play these, but it’s a double-edged sword. Others offer favorites on the playlist, which sometimes just don’t stand up to comparison. Perhaps clamored for, but the band’s heart (or energy level) ain’t up to it. Ergo, my reluctance to invest in many of the recordings. The hybrid results of Santana’s Moonflower the happy middle ground. A bright mix of the Chicano-rock that hooked me with their premiere album, and their dive into the Jazz Fusion that claimed me and the group’s work later in the decade. Either way, a heady combo for a heavy, turbulent time to get lost in; particularly when you really needed to. The impact reflected by the striking use of a Yoshikazu Shirakava1 photo for the album cover. The majestic aerial shot2 of precipitous mountains piercing tumultuous clouds graced the full gatefold, suggesting a visible antithesis. Not only against the LP’s stylish titles, but the sedate blue bordering the margins and inner sleeve. 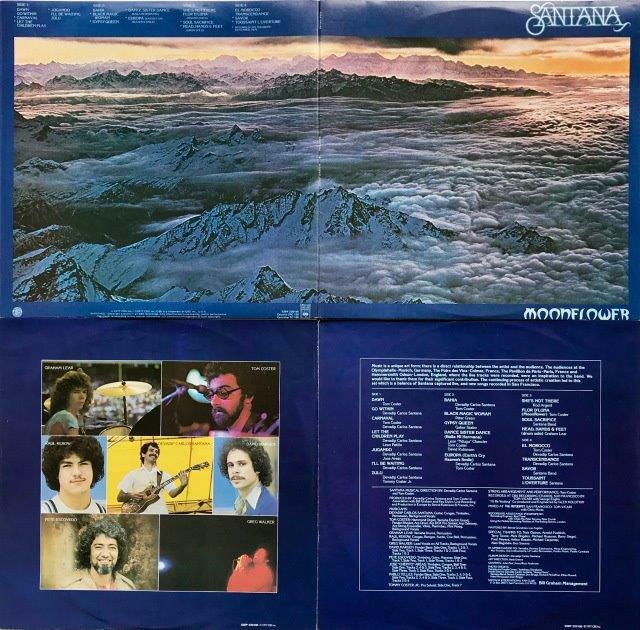 A picturesque maelström captured, held back by the horizon’s light, fixing the viewer; symbolic of Santana’s music doing same for the listener in a troubled period. It certainly is a wonderful cover photo, and a solid partially-live album. And thanks for the shout-out too! A terrific look at this album, and what a beautiful cover – which are sorely missed today! Excellent choice for this series, Michael. I’ve always loved this album and its cover. Nice!